Module 5 – Circle 5 Good Company. Why should we care about our company? 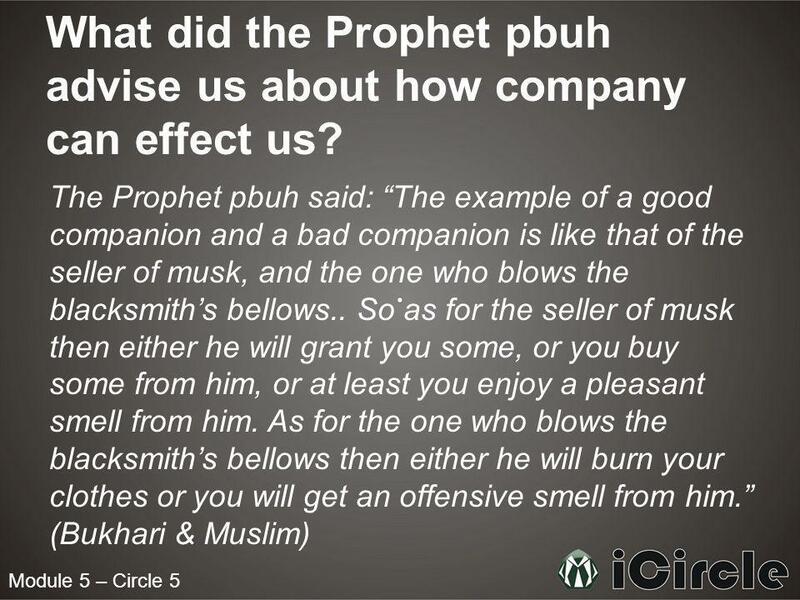 Umar (ra), said that the Prophet pbuh, said: "It is incumbent upon you to be with. 6 Module 5 – Circle 5 Should we choose who to befriend? Abu Hurairah, reported that the Prophet pbuh said: Man models himself after his companion; so let each one of you see who he chooses for companion (Tirmidhi). 7 Module 5 – Circle 5 Can our company effect our characters/manners/prayers? Another scholar said: keeping good company with the pious results in attainment of beneficial knowledge, noble manners and righteous actions, whereas keeping company with the wicked prevents all of that. 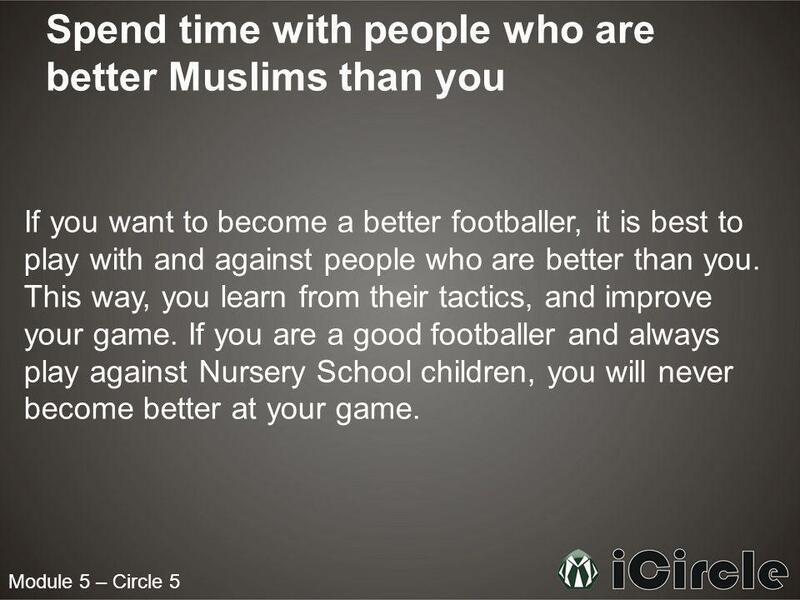 9 Module 5 – Circle 5 Spend time with people who are better Muslims than you If you want to become a better footballer, it is best to play with and against people who are better than you. This way, you learn from their tactics, and improve your game. If you are a good footballer and always play against Nursery School children, you will never become better at your game. 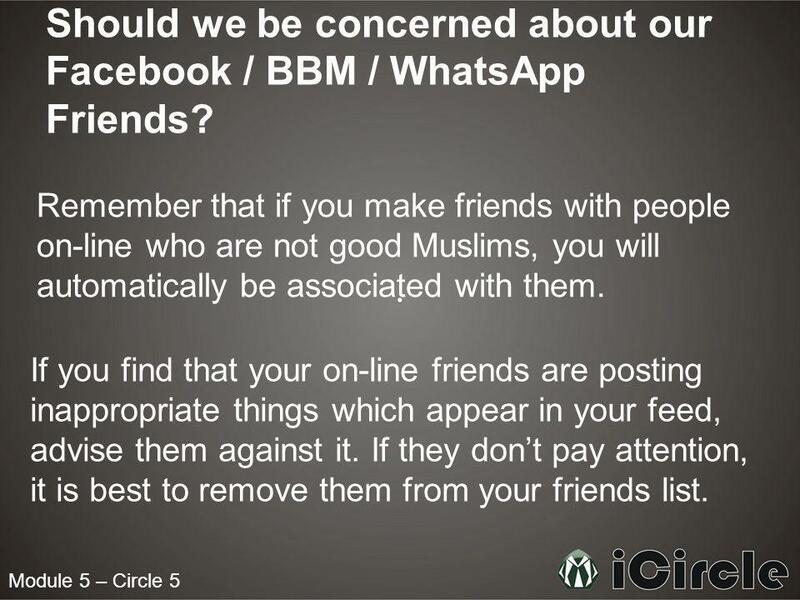 10 Module 5 – Circle 5 Should we be concerned about our Facebook / BBM / WhatsApp Friends? 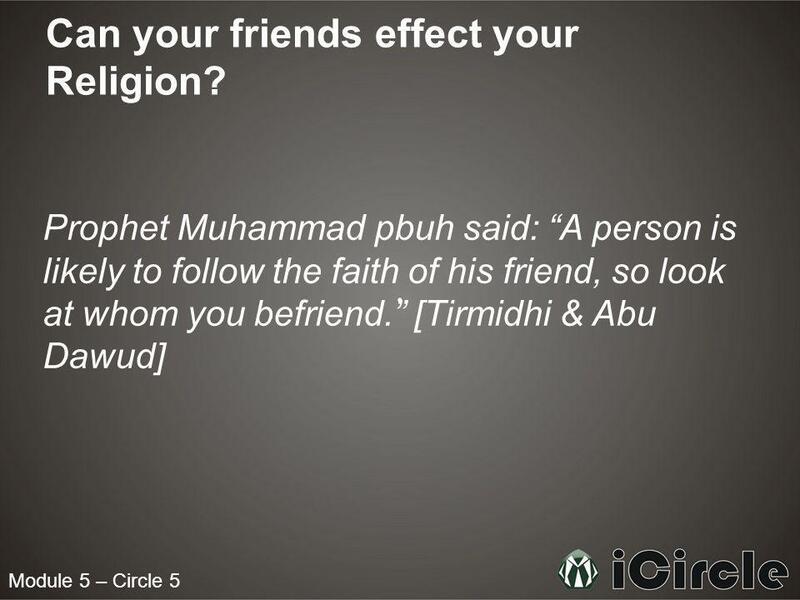 Remember that if you make friends with people on-line who are not good Muslims, you will automatically be associated with them. If you find that your on-line friends are posting inappropriate things which appear in your feed, advise them against it. If they dont pay attention, it is best to remove them from your friends list. 12 Module 5 – Circle 5 The Cool Kidz Amina started a new School and within a few weeks realised that some girls in her class were the most popular in the school. She began to hang around with the cool girls who happened to be quite naughty. At lunchtime, they would hide behind the Science block and smoke cigarettes. Amina was a good Muslim and knew it was haraam to smoke, so refused to smoke when they asked her to join in. She thought that she was strong enough to be with the popular girls without being influenced in a bad way. 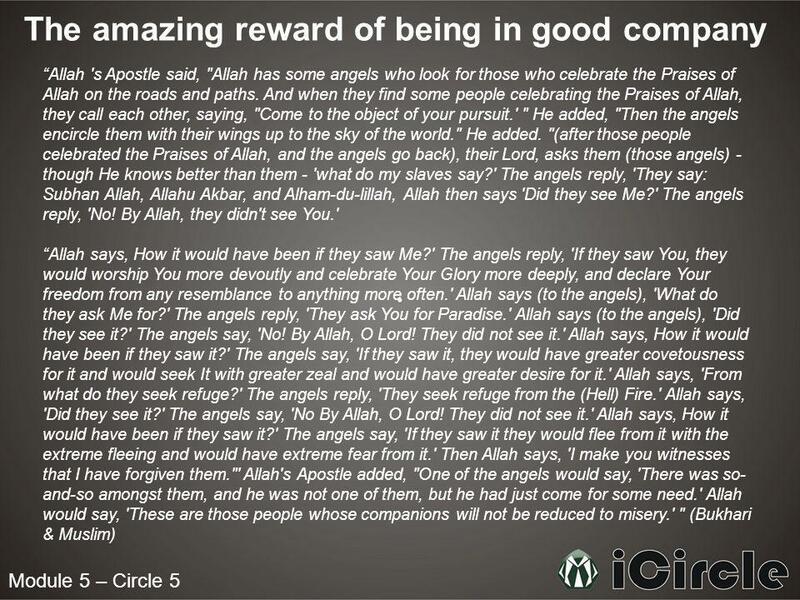 She thought that she may even have a good effect on them, as she was a Good Muslim. Over the months, the girls convinced Amina to have just one puff of a cigarette. She eventually agreed, and within a few weeks began to smoke as regularly as the other girls. 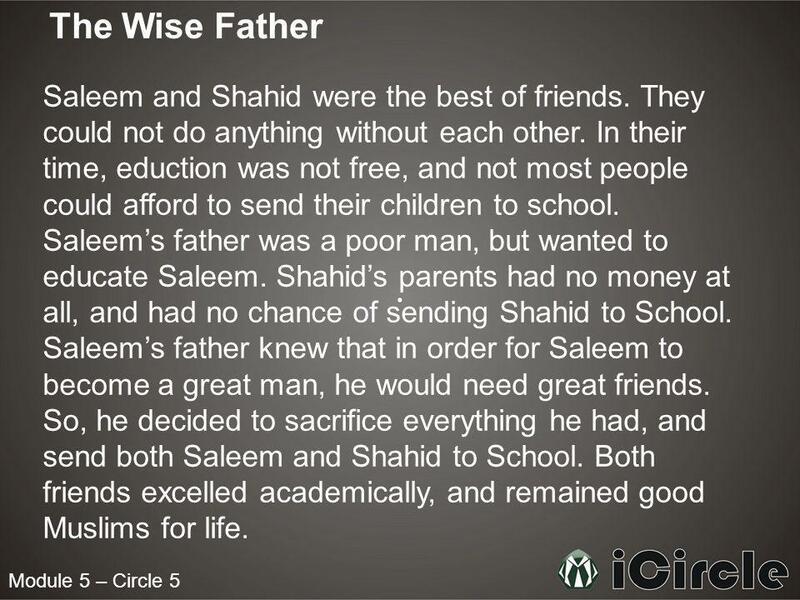 13 Module 5 – Circle 5 The Wise Father Saleem and Shahid were the best of friends. They could not do anything without each other. In their time, eduction was not free, and not most people could afford to send their children to school. Saleems father was a poor man, but wanted to educate Saleem. Shahids parents had no money at all, and had no chance of sending Shahid to School. Saleems father knew that in order for Saleem to become a great man, he would need great friends. So, he decided to sacrifice everything he had, and send both Saleem and Shahid to School. 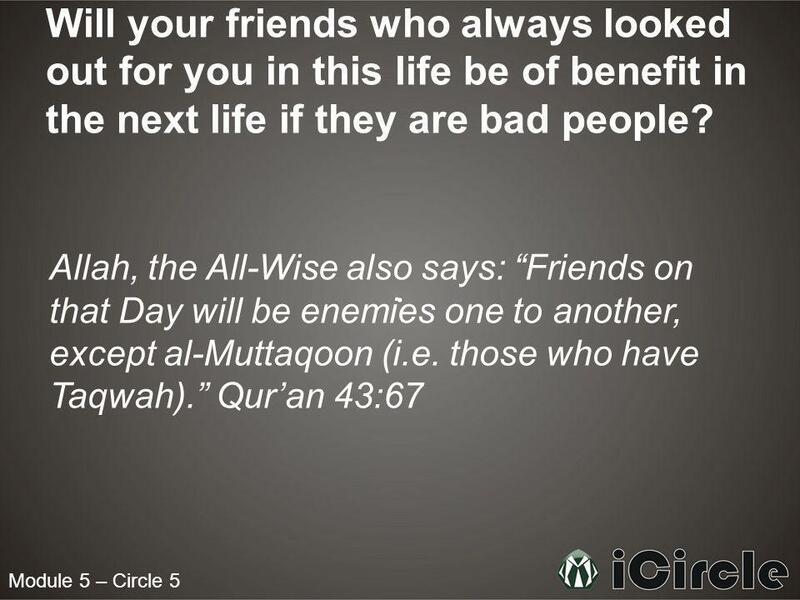 Both friends excelled academically, and remained good Muslims for life. 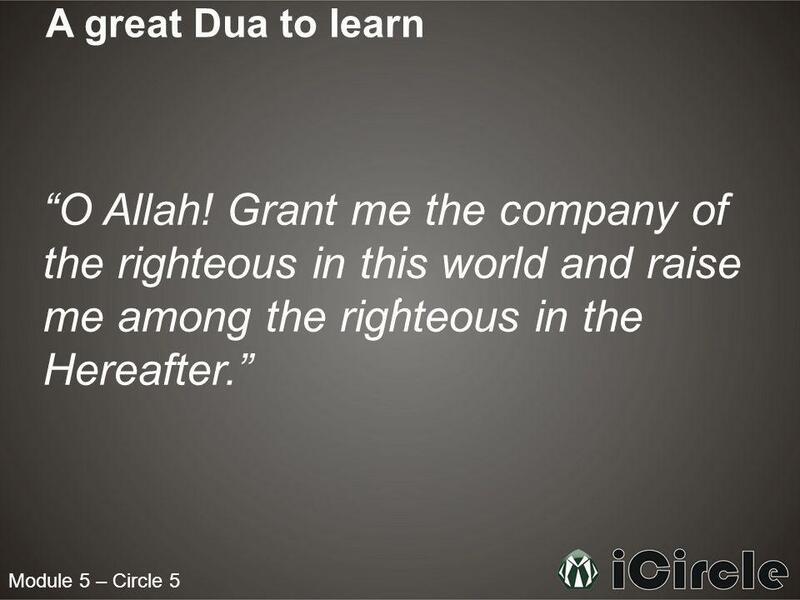 15 Module 5 – Circle 5 A great Dua to learn O Allah! Grant me the company of the righteous in this world and raise me among the righteous in the Hereafter. 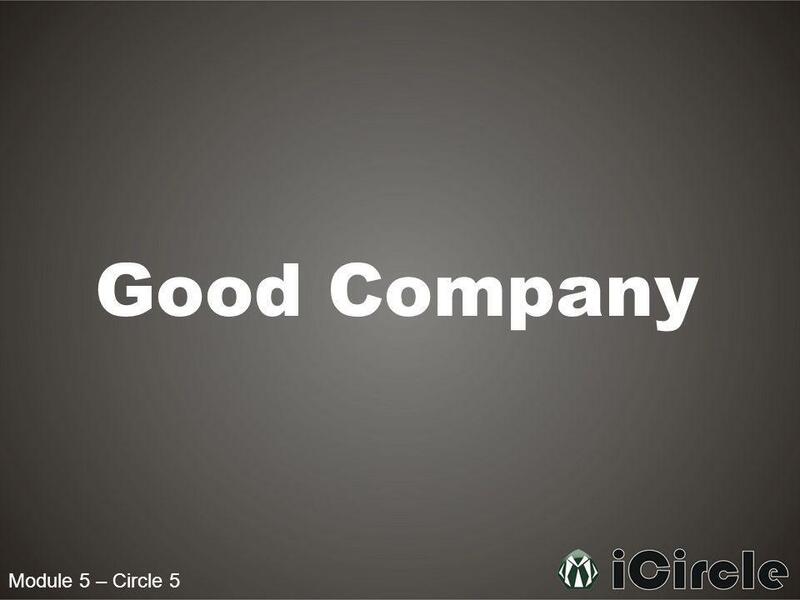 Download ppt "Module 5 – Circle 5 Good Company. Why should we care about our company? Umar (ra), said that the Prophet pbuh, said: "It is incumbent upon you to be with." 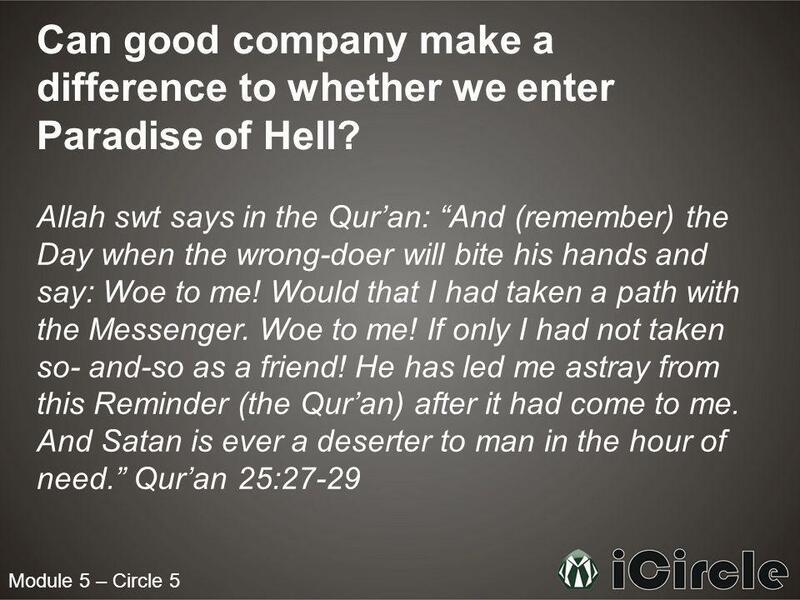 The Day of Judgement Module 1 – Circle 3b. Module 4 – Circle 3 Procrastination. What is Procrastination? To procrastinate means to put off doing something, especially out of habitual carelessness. Module 1 – Circle 16 The Prophet Adam (as). Module 1 – Circle 16 What was the first thing that Allah created? "The first thing which Allah created was. ETIQUETTE OF EATING ‘ In the light of Sunnah’. Selections From Sahih Al- Bukhari Selections From Sahih Al- Bukhari. Module 1 – Circle 4 Hell Fire & Paradise. 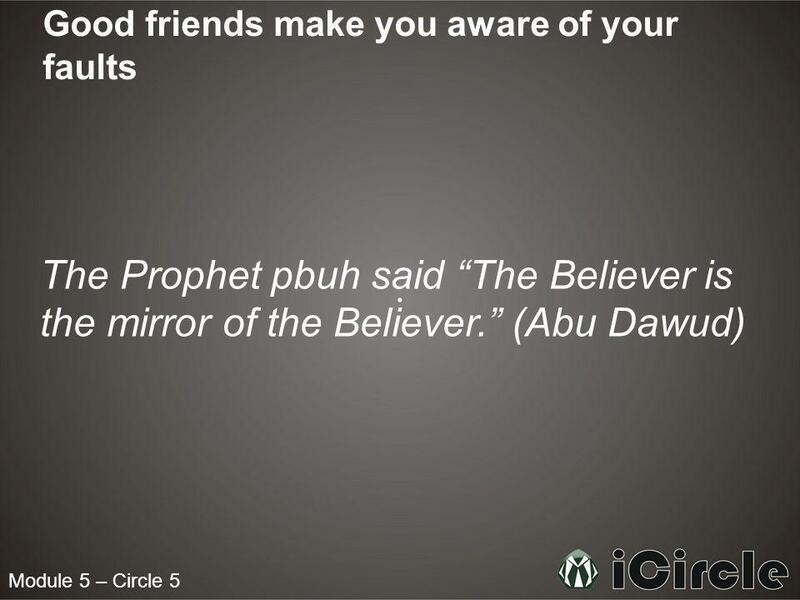 Module 1 – Circle 4 Is the Hell Fire only for the people who do not believe in Allah swt & His Messengers (pbut)? ‘ILM Gotta Have it!. علم Knowledge Information Facts Data Know-how Skill Wisdom Learning Education Ignorance. Basic Teachings of Islam Leeds Makkah Masjid Dua – Supplication. Hadith Session 13 Ramzan Shahid.